We listen to our customers vision and bring it to life. Usually there is something about your motorcycle that you want to make real. You might have a picture, a sketch or a tattoo. Whether you want some unique graphics to set off an all-black bike, or you want to turn your ride into a wild animal, we can make that happen. Sometimes it takes both paint and metal fabrication to to bring your vision completely to life. We help you find the colors and designs by in-person visits to our shop, phone calls or email. We may sketch the art for you before it is finalized, then you approve it. Call (407) 847-0119 for information, or contact us by the form at the bottom of the page. Click for more motorcycle customizing options. 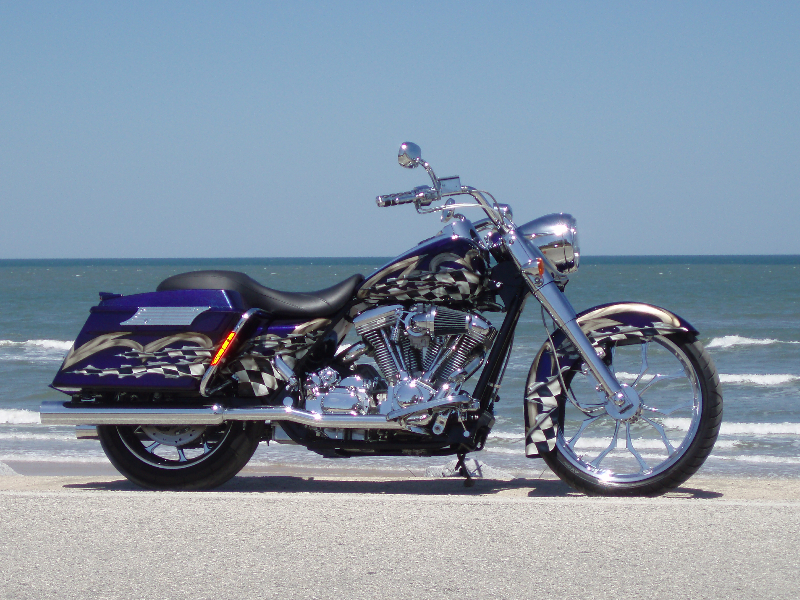 The cost for custom paint varies depending on the kind of motorcycle. We design the paint job your budget in mind. Larger parts require more time and materials to paint. Mural artwork usually takes more time than flames. But for painting a single color and either flames or graphics on a motorcycle tank and two fenders, it averages $1600 – $2700. Smaller jobs cost less. Cruisers and full dressers cost more because they just have more parts and there is more labor involved in taking the parts off for painting.